“The problem is that for a democratic government, freedom of religion is nothing more than freedom of worship; in other words, the right to believe in whomsoever or whatsoever one wishes, as long as that is done at home or in appropriate places”. This is a quotation from an article in Il Foglio (Italian daily newspaper) by Matteo Matzuzzi (“The most holy grip”, 12/03/2016). The journalist was writing about religious practice in the USA which, especially under the Obama administration, has declined from faith lived to a “private obsession”. In is undeniable that the religion issue, or, in even better terms, the transformation of the principle of laicity into ideological laicism, is one of today’s major problems. This is also broached in a recent book written by several authors entitled “The New Wars of Religion (Cantagalli (2016, pgs. 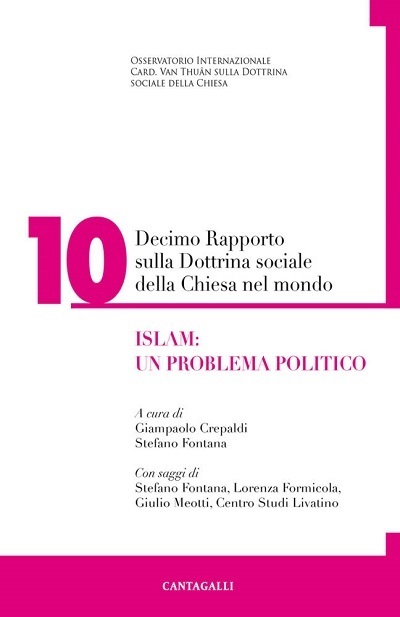 96, Euro 9,50) in which – as specified by Archbishop Giampaolo Crepaldi in the introduction – also examined are the “wars against religion” alongside the “wars of religion”. As Most Rev. Crepaldi points out, when terrorists perpetrate attacks in France against Charlie Hebdo or in the Bataclan theater, or when BokoHaram militants massacre people in Nigeria, “it is an evident return to wars of religion” because the religious motivation is the triggering factor. On the other hand, when the western world at large – the USA and Europe in particular – deem it necessary to have to proclaim “indifference to religions”, canceling de facto the possibility of any public expression of religion, it is more correct to speak in terms of “wars against religion”. In the body of the book itself His Excellency delves deeper into his argumentation in the chapter entitled “Laicity, Christianity, the West. A profile of the history of ideas”. Above all, he reiterates that the principle of laicity was conveyed by none other than the Christian faith. As asserted on numerous occasions by Joseph Ratzinger, the relationship between the West and faith was in no way “a contingency in the history of Christianity”, and that this relationship had been “essential in nature”. In fact, all too little emphasis is given to the importance of dogma in western history at large. But Archbishop Crepaldi does so here when reaffirming the often omitted truth that the “Church gave shape to western Christian civilization with its dogmas”. It is misleading in this regard to relegate dogma to the supernatural realm alone, or to the inner reaches of a believer’s conscience. On the contrary, dogma “by its very nature becomes history and hence civilization” through human salvation willed by God. For example, only through the dogma of the dual nature of Christ (human and divine) was it possible, Archbishop Crepaldi explains, to preserve civilization from the Gnostic nihilism that rejected the material nature of the family, destroying its selfsame bases. In addition, the dogma of the Immaculate Conception countered the evils stemming from the negation of original sin, without which man is good and destined to progress alone, without any need for Grace. Even modernism, the foe of dogma by definition, ended up having to replace Catholic dogmas with just as many laicist dogmas whose particularity resides in their absoluteness. This was the case, as Most Rev. Crepaldi writes, of the positivism of Auguste Comte, which acknowledges the processing of laicity in Christianity, as well as the usefulness of Catholic dogma for the social order. As Comte argues, however, once the equilibrium was lost and laicity turned into laicism with the relative emancipation of the temporal order from the spiritual order, we are faced with an absolutely “irreversible” process. This absolute and historicist irreversibility is the new dogma of modernists: secularization has imposed itself at large and this fact is irreversible in temporal terms. Secularization was then accompanied by the negation of the supernatural, as well as of Grace and the Church which transmits it. Therefore, here we see the possible genesis of the “war against religion” being waged by part of secularized and absolutist modernism. Therefore, in what sense are we to understand the principle of the “freedom of religion” that the State should guarantee? Stefano Fontana deals with this in the chapter entitled “Freedom of Religion and political duties towards the religio vera: the Syllabus, Vatican II, Joseph Ratzinger”. As Mr. Fontana explains, the Magisterium prior to Vatican Council II denied the right to freedom of religion on the basis of the fact that there cannot be “separation between liberty and truth”. In other words, if the Christian religion were “true” – as it is true – political power would not have the right to assume a neutral position. The state should confess the truth of that religion and assume its aims and ends (not its means) with a view to the common good. All the more so since the kingship of Christ set forth in the Magisterium also extends over temporal realities. With Vatican II, writes Mr. Fontana, freedom of religion becomes a “right”, albeit not in an “absolute” sense. According to the less than crystal clear text of Dignitatis humanae, it could be said that the Council rejects the concept of confessional state, while retaining the principle of the kingship of Christ. In any case, the later clarifications of Pope Benedict XVI would seem to confirm – according to Mr. Fontana – that “the end of the confessional state does not mean politics has lost its own duties towards the true religion”. Mr. Fontana’s thesis also seems well grounded because of another aspect. It is probable that when stating its position on freedom of religion, Vatican II was referring only to the “internal forum” of individual conscience, and not the social “external forum” ever bound to confess the true religion. Dignitatis humanae does not speak of internal forum or external forum, but when a Council says nothing about a certain truth, this does not mean it intends to deny it, because it does not pertain to a Council to reiterate the contents of the deposito Fidei in its totality. Omar Ebrahime also reflects on the “war against religion” in the chapter entitled “The West’s war against Christianity”. This is a synthesis of the well known “Christian-phobia” which, especially in Europe, above all exposes Christians (in the best of cases) to the “martyrdom of ridicule”, whereby the unfortunate person in question is dissuaded from speaking out or taking a stand in society through forms of public derision and defamation. In the worst of cases, such a person is literally thrown out of the political forum, persecuted or imprisoned, as we see happening ever more often. Gianfranco Battisti, in “The geo-politics of religions at the time of the return to paganism”, evokes Samuel Huntington’s thinking with regard to the “necessary conflict between civilizations” since there is a problem linked to religion insofar as a “factor of division”. In brief, geo-politics cannot ignore the fact that alongside a “genuine missionary thrust”, religion (in a general sense) at times transmits the desire to exercise dominion over other peoples through “the ideological coverage of group interests”. In this manner religion can become “a powerful factor of political mobilization”. Battisti’s analysis is wide-ranging and investigates the wars of religion in depth, including the prevailing practice of civil wars. Two examples suffice: the European wars within Christianity in past centuries, and the current warfare between Shiite and Sunnite Muslims. The origin of Islam is the topic dealt with by Ms Silvia Scaranari Introvigne in “Violence and peace of old and new caliphates”. In particular, she sheds light on the historical reality of Sunni Islam and Shia Islam, as well as the genesis of the caliphate. Civil wars: that is to say wars within countries. And yet the selfsame reality of State-Nation is nowadays victim to a process of internal erosion. Mr. Miguel Ayuso addresses this topic in the chapter entitled: “Pacifism, new war and crisis of the State”. The modern state, writes Mr. Ayuso, is, among other things, an effect of the industrial revolution, which was followed by “massification” and “centralization in political and economic terms”. Now very much at play, however, are new forces that decentralize powers; for example, electronic technologies applied to communication. In fact, all this has eradicated national borders as a result of new “functional and non territorial” powers that outclass not only the power of states, but also their very ethical – moral foundations. It must not be surprising that in such a scenario power has slid more and more to so-called “international bodies” particularly hostile to the Church and “at the service of not always confessable ideological causes”.